Journey with Dietitian Shayna Komar and Chef Nancy Waldeck through the seasons in these 4 unique webinars. Each season they will provide you with recipes, tips, and ideas on how to use seasonal produce with the right herbs and spices. Listen and learn why great chefs and dietitians alike go to the garden to spice up their clients' kitchen! Click here to see a personal message from Shayna and Nancy! Recommend regional, seasonal produce with complementary herbs and spices. 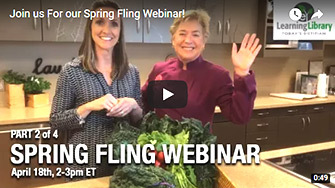 Provide clients with 7 recipes per webinar based on the seasonal produce. Demonstrate tips and techniques that will assist the home cook with the provided recipes. Direct clients to resources on the produce in their area. Discuss evidence-based health benefits of herbs and spices in relation to a healthy well-balanced food plan. REGISTER FOR ALL 4 PARTS at a discounted rate of $60 by adding all 4 webinars to your shopping cart and applying coupon code SEASONSMIX at checkout! Please note: this discount applies only to non-CE Club Members. Shayna Komar is a Registered and Licensed Dietitian in Atlanta, GA. She completed her undergraduate degree in Nutrition, Foods, and Exercise at Virginia Tech and her dietetic internship at Johns Hopkins Hospital in Baltimore, MD. Shayna currently contracts with Cancer Wellness of Piedmont Hospital where she provides individual nutrition counseling, cooking classes and group lectures for cancer patients and caregivers. Shayna was the proud recipient of the 2006 Distinguished Dietitian of the Year award from the Academy of Nutrition and Dietetics (Academy). She has presented nutrition lectures all over the United States including Las Vegas, NV for the Oncology Nursing Society, Greenville, SC for the Healing Journey’s Cancer Survivor Conference, and Philadelphia, PA for the Living Beyond Breast Cancer Annual Conference. In 2013 she was on the Academy’s Speakers Bureau for oncology dietitians. She has been featured as a nutrition expert on Fox News Atlanta, CNN Accent Health, WSBTV Radio, and most recently, 11Alive Atlanta and Company. She writes weekly with her colleague, Chef Nancy Waldeck, on their blog livingandeatingwell.com on the health benefits of spices. Shayna is an avid fitness enthusiast and has been teaching group fitness classes for 20 years. She stays busy at home with her own “sports team” comprised of three young sons and her husband. 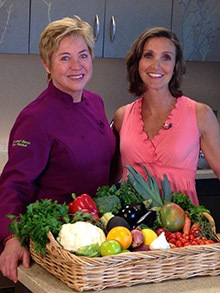 Healthy Chef, Partyologist Nancy Waldeck's exuberant approach to healthy cuisine and fun wine leads her to deliver over 100 classes a year in interesting locations - including United States embassies; corporate offices like Google, Southern Company and Norfolk Southern; Hospital Wellness Centers; regular segments on NBC Atlanta and Company; farmers markets; and conferences from 10 to 1000. Nancy loves to partner with Shayna to translate dietetic information and put it into kitchen action for the Thomas F Chapman Family Cancer Wellness Center in Atlanta and other groups interested in eating well and cooking better. Shayna Komar and Nancy Waldeck have no relevant disclosures to report. They have certified that no conflict of interest exists for this program. View our disclosure policy.